Isn't this the cutest baby hat you've ever seen? A talented local photographer here, personally asked me if I could crochet cute baby hats for her to use in her newborn photography sessions. I only started crocheting last summer, but I was up for the challenge. This is only a demo to see if I could actually do it with whatever yarn I had around the house. I need to go get some soft, baby yarn the next time I'm up in Edmonton. 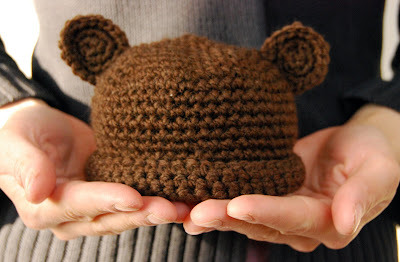 I wish I can take credit for this cute little pattern, but I found it here on Naida's Crochet. I can't wait to see this used and if it actually fits on a cute newborn baby. Great job Monita! I can't wait to see it on some cute newborn as well! OMG!!!! Too cute. How much do you sell them for? I'd love for you to make me a couple of hats. Great job! SiS YOURE INSANE! THAT LOOKS SO WICKED! who cares if you didnt make the pattern! its ADORABLE! Oh so awesome! I can't wait! You just have such incredible talent! Can't wait to see what you come up with for the rest!! Very very cute Monita!! Can't wait to see some of Allison's pictures with this hat, adorable!!! Thanks for the link to the pattern. Yours looks different, did you modify at all or is it a size difference? Do you have the pattern to this? The link doesn't seem to be working? Thanks!!!! Nadia's blog has moved. Link has been fixed. Thanks! jajajaja if I make something like this to my son, for sure he end looks like a ewok from Star Wars episode VI, or at least in that way I can imagine him. I'm 100% agree with Arizona above me! I just love it. I will do my best to find blogs with this characteristics because all this makes me feel happy again.